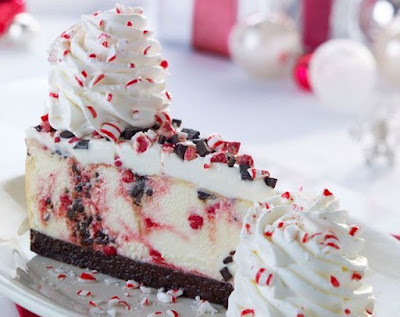 The Cheesecake Factory brings back their festive Peppermint Bark Cheesecake leading up to Christmas. The seasonal dessert consists of white chocolate cheesecake swirled with chocolate peppermint bark pieces, topped with white chocolate mousse and chopped peppermint. Since it is the holiday season, the chain will donate 25 cents to Feeding America, a charity aimed at ending domestic hunger through a national network of food banks, for every slice of Peppermint Bark Cheesecake sold through the end of the year.